The other side of minimalism: What do I do now? 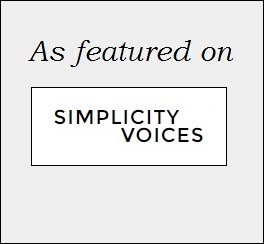 Simplicity Voices is a curated space for the web's best articles on minimalism, slow living, wellbeing and financial freedom. It is run by Claire, the creator of wantless.co.uk, a blog about ditching stuff, beating debt and getting a life. The articles featured are copyright of their respective publishers. Obviously. Simplicity Voices doesn't have a newsletter, but you can follow Claire on Facebook or Twitter for weekly digests. Scroll down for the social media links. And if you know of any great articles we've overlooked, you can email Claire below too. Help keep Simplicity Voices online and ad-free by making either a one-off or monthly donation. Been featured? Take a badge!